Miss Jean Model Botswana (founders of Miss World Tourism Botswana, organisers of BOCCIM trade fair) and BlackNBold Fashion House, a Uk/Nigeria based fashion promoting company, founders of the biggest student fashion week in Africa; Nigerian Student Fashion And Design Week presents the maiden edition of Botswana Culture And Design Week. BCDW is committed to providing a unique platform for new, up‐and‐coming fashion designers from Botswana and other African countries to showcase to one of the biggest fashion market in Botswana, this been the student, young and trendy upwardly mobile young generation. 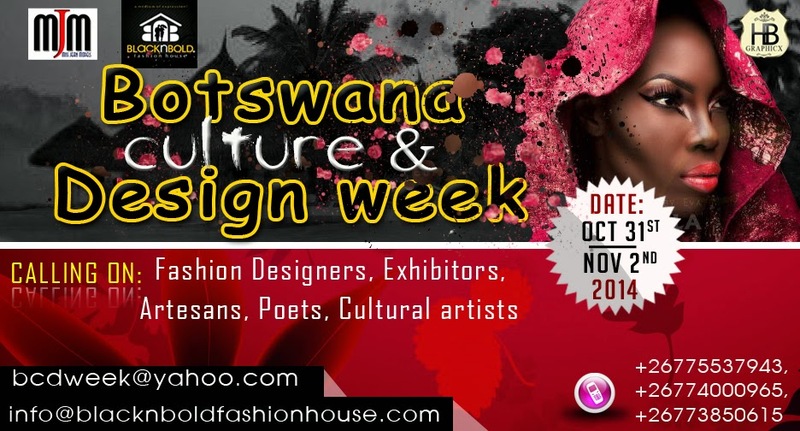 Unlike other fashion weeks, Botswana Culture & Design Week will cover fashion, art, music, food expo, and poetry. It will also provide a platform for fashionistas, buyers, and the press to interact under one roof over the three days. The maiden edition promises to be very exciting as it will host various designers from various african countires and with the latest partnership with Television Continental (TVC), africa's leading television station, and other notable fashion blogs across the africa coming on board. Botswana Culture And Design Week will be taking place from the 31st of October to the 2nd of November 2014 at the beautiful city of Gaborone, the capital of Botswana, a city known for her rich traditional culture and beautiful landscapes making it the perfect location for this event. Invited Guests are the Minister of Tourism of Equitorial Guinea, Ms Bokoko (Executive Director of Spain-Us chamber of commerce in America, whose desire is to help Africa grow and develop into world power. Other guests are members of parliament, and diplomats.